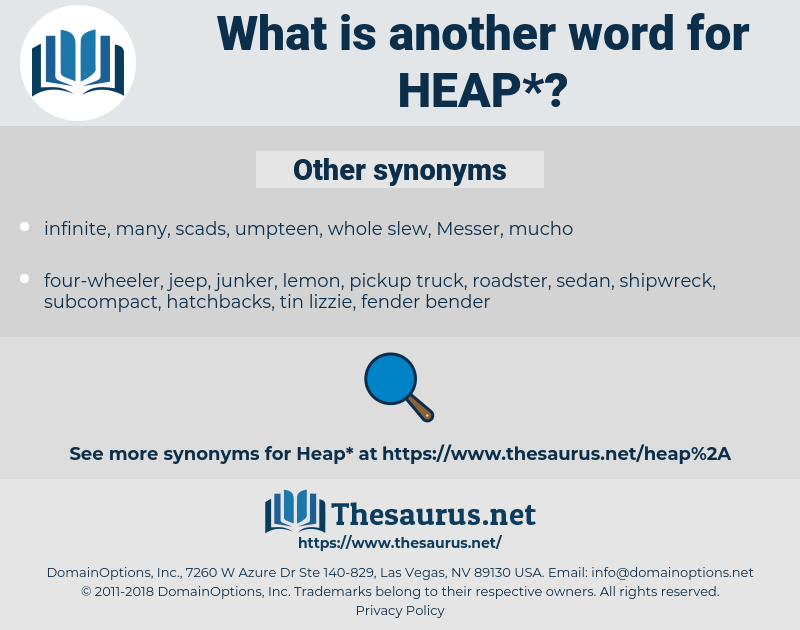 What is another word for heap? individual, want, valley, need, ditch, lack, debt, part, one. 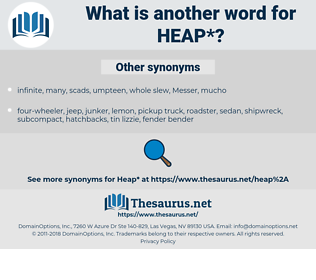 hint, ace, pinch, scantness, section, nubbin, deficit, molecule, jot, scruple, scarcity, ounce, dash, mouthful, pittance, skimpiness, mote, nip, piece, fragment, trace, inadequacy, taste, iota, poverty, particle, shot, deficiency, strain, little, driblet, lick, dot, scantiness, scrap, glimmer, fleck, smidgen, suspicion, speck, morsel, shred, tittle, shadow, grain, ray, modicum, scintilla, bit, scarceness, shortage, tad, portion, spot, shade, paucity, touch, crumb, insufficiency, whit, dab, dram, atom, drop, meagerness, undersupply, famine, granule, streak. distribute, lose, deplete, spread, divide, separate, waste, lessen, mix up, diminish, subtract, squander, use, spend, decrease, scatter, disperse. Well, how d'you expect to come out on top of the heap? There's only one I'd ever marry, Jinny, protested the Captain, soberly, and I'm a heap too old for her. funeral pyre, compost heap, compost pile, slagheap, midden, shock, muckhill, scrapheap, dunghill, stockpile, woodpile, muckheap, stack, pyre. fill up, make full, fill.